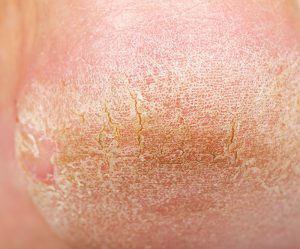 Heel fissures, commonly referred to as cracked heels, are a simple problem that could lead to severe medical issues in future if left untreated. The fissures occur when the skin around the heel develops to become hard, dry and cannot stretch so therefore cracks instead. In some cases, the cracks are deep so can be painful and bleed. If you think you are suffering from heel fissures then give us a call on 01386576128or get in touch via our contact page to arrange an assessment to see how we can help you.